It’s one of the largest divisions in the office and its Deputy DAs handle all felonies not assigned to a branch or vertical prosecution. This division is responsible for more than 25 percent of all felony cases tried by the District Attorney’s Office. 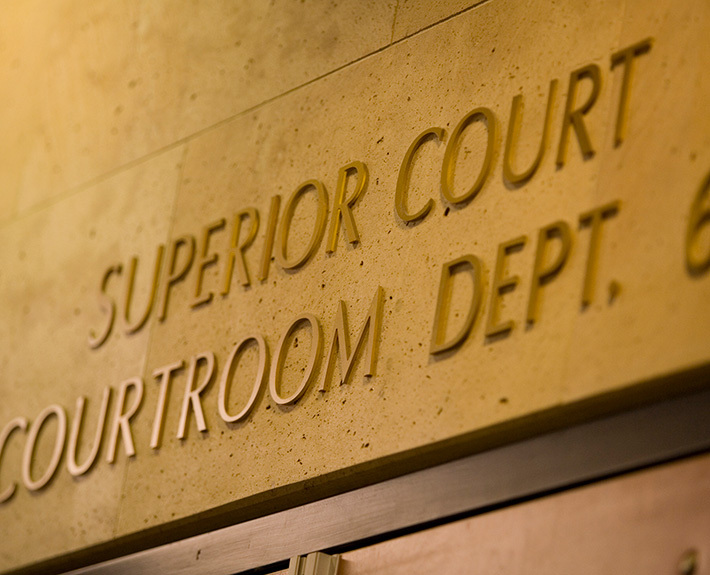 Training and development of Deputy District Attorneys is an important aspect of the Superior Court Division. Monthly training sessions are presented on various aspects of criminal prosecution. Riding along with law enforcement officers is encouraged as well. The division consists of six teams: pretrial, case disposition, trials, major violators, DUI homicide and cold case homicide. These prosecutors handle a large number of serious cases. 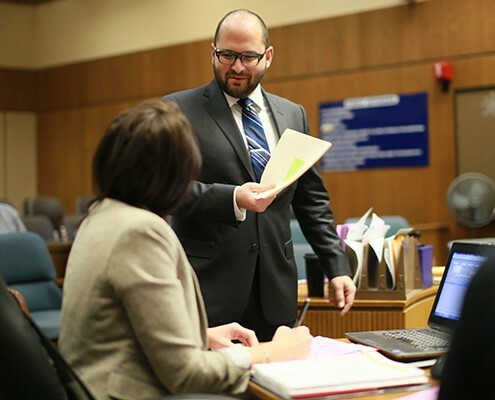 They arraign defendants charged in felony complaints, then prepare and conduct preliminary examinations in front of a judge to prove the charges based upon a probable cause standard. In doing so, the preliminary hearing Deputy DAs are liaisons between the DA’s Office, law enforcement and the victims and witnesses of crime. DDA Melissa Vasel convicted the defendant of second-degree murder for a knockout sucker punch attack on a Gaslamp Street in June 2014. The victim sustained a fatal brain injury due to the tremendous force of the punch to his head. In July 2015, the defendant was sentenced to 15 years-to-life in prison. In August 2014, the meth-intoxicated defendant crashed into a group of cyclists on Fiesta Island while driving the wrong way. Several riders sustained critical injuries leaving one a paraplegic, one with a shattered elbow and one with permanent facial scarring. 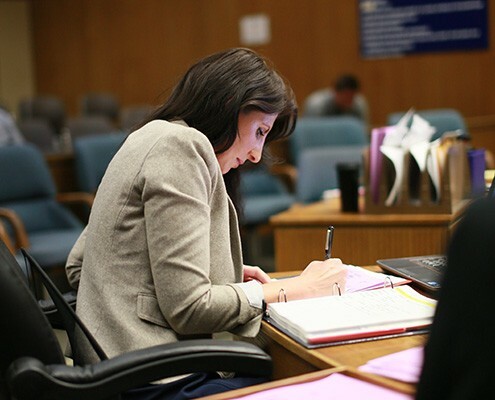 DDA Jessica Coto convicted the defendant of felony DUI causing great bodily injury. In November 2015, she was sentenced to 19 years in prison. DDA Amy Maund convicted the defendant of multiple counts of attempt premeditated murder with the infliction of great bodily injury for attacks on unsuspecting victims in their homes. 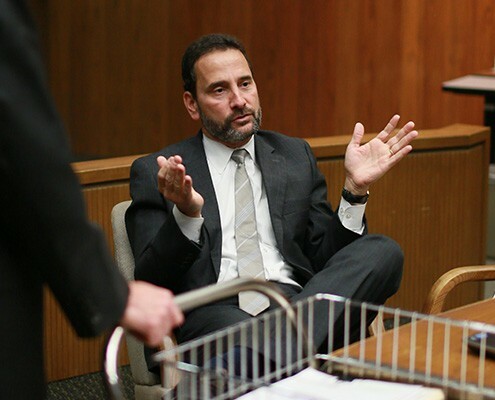 In September 2013, the defendant went to his ex-business partner’s home in La Jolla late at night and fired into his bedroom. Four hours later he arrived at his ex-wife’s brother’s home, where he shot the victim in the bathroom. After a lengthy trial the defendant was convicted and sentenced to life in prison plus 64 years. The unit prosecutes criminals with extensive felony backgrounds, serial robbers and other defendants charged with numerous serious felonies that face extraordinarily long prison sentences. In 2015, the prosecutors assigned to the unit closed 30 cases involving 36 defendants whose combined crimes included 81 robberies, 57 residential burglaries, two carjackings and a kidnapping. Two life terms and lengthy prison terms ranging from 41 years to 12 years were imposed on these defendants. The defendant, on his second strike, committed a series of armed robberies at Subway, Kentucky Fried Chicken, and Burger King. During the robberies, he moved the employees into the freezer before fleeing with the money. A jury convicted Robbins of 12 counts of armed robbery. He was sentenced to 41 years in prison. Deputy DA Roy Lai prosecuted this case. The defendant was a third striker who committed a series of robberies at Subway, gas stations, and Circle K over the course of six weeks. He was armed with a replica firearm during the robberies. Although most of the robberies were captured on surveillance video, the defendant’s face was concealed by clothing. Circumstantial evidence tied the defendant to the crimes, including DNA, a getaway car, boots, and boot print evidence. He was convicted after a jury trial of eight counts of robbery and sentenced to 304 years-to-life in prison. Deputy DA Jim Koerber prosecuted this case. While out on bail pending trial on seven robberies of Boost Mobile stores, defendant Jones robbed two more stores. He pleaded guilty to all crimes and was sentenced to 30 years in prison. Deputy Jalyn Wang prosecuted this case. The petitioner filed a petition for a writ of habeas corpus, seeking a new trial. The petitioner claimed that his trial attorney provided ineffective assistance. He further claimed that a witness was coerced to testify and committed perjury at trial. Deputy District Attorney Julie Reizen filed a brief opposing the petition, countering the claims made by the petitioner. The Superior Court agreed with DDA Reizen and denied the petition. In this case, the DUI murder defendant crossed over lanes of traffic and crashed head on into victims near Pala on SR76. One victim was killed on the scene, another had two broken ankles and spine fractures and a third person had a bruised heart and concussion. Deputy DA Aimee McLeod prosecuted the defendant, who was convicted and received 15 years and four months in prison. The Cold Case Homicide Division exists to promote public safety by resolving the unsolved homicides within our county. The division has worked cooperatively with local law enforcement to systematically inventory all cases of unsolved homicides and missing persons that are on file in the different agencies. The division assists law enforcement by investigating and resolving these cases in order to bring the guilty to justice and closure to the families of victims. On Christmas Eve in 1991, 21-year-old U.S. Marine Lindell Mitchell had an argument at a party with the 16-year-old defendant. The defendant enlisted the help of her relatives who came back and shot the victim in the back. In 2015, Deputy DA David Williams III, prosecuted Andrews, who was convicted of first-degree murder. The defendant was convicted of special circumstances murder for a 1999 home invasion killing. The victim was shot and killed when he answered a knock at his front door. Mora was sentenced to life in prison without the possibility of parole. Deputy DA Andrea Freshwater prosecuted this case.